Too close for comfort… and crop marks | Colecandoo! When preparing PDFs for commercial printers via Adobe InDesign, be aware of how far away any crop marks generated by the export will be from the trim-size of the finished artwork. It is not uncommon for printers to ask their clients to prepare PDFs to certain specifications. Some instruct their customers to use standard defaults such as PDF/X-3: 2002, some will have their own step-by-step instructions to the export dialog boxes, while others are more sophisticated and offer pre-saved joboptions files for clients to download and install. Pre-saved joboptions files are my preference given that these settings supplied by printers to their customers are normally the same settings that the art department will use in-house, so will be fine. 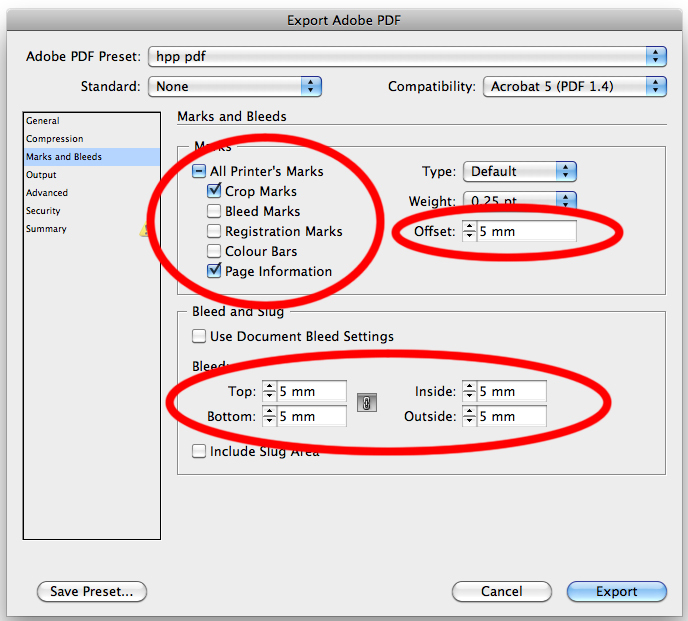 However, using the shipped defaults or following step by step instructions can be problematic as it is easy for one major check-box to be missed which can cause delays in the art department: the Marks and Bleeds dialog of the PDF export window. 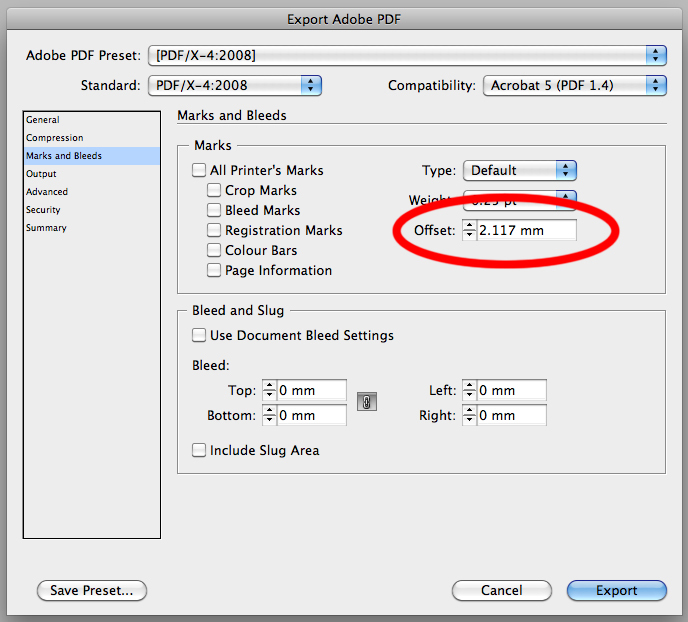 The exports which ship with Adobe InDesign all have a crop offset of 2.117mm as default, (as shown above) which is not a lot. In the example above, none of the marks and bleeds have been turned on either, nor have the bleeds been set, yet this is how the defaults shipped with InDesign will appear. It is not uncommon for a printer to ask a customer to submit a PDF with crop-marks on, but if a customer is making a PDF based on default settings and then changing the default values by simply clicking marks on or off without changing the offset values, then problems can occur later. The issue comes about because crop marks which are too close either have to be removed on the PDF itself, or if the problem marks are left and and printed, may appear on the finished printed artwork. The position of the print cannot be guaranteed to be consistent on every sheet of paper (especially on digitally printed artwork) so variations in image position occur, so while the guillotine will be precise, the position of the crop marks from one sheet to another may not. 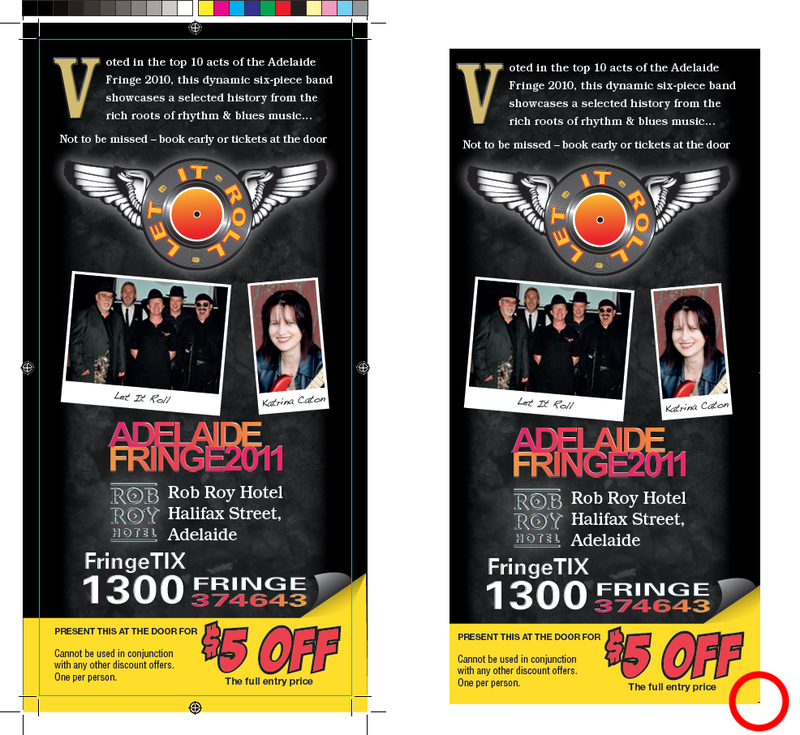 The example above shows the PDF file on the left created with only 1mm offset while Crop Marks, Bleed Marks, Registration Marks and Colour Bars are turned on. The result on the right is due to trimming innacuracy using the above PDF. This doesn’t look like much of an issue on a DL flyer, but the consequences on a 400 page book would be much greater given the variations which can arise not just from the printing but also the folding, binding and then trimming. Delete the marks using third party tools in Adobe Acrobat Professional such as Enfocus Pitstop Professional, which has more advanced selection and removal tools… but once again hope that none of the actual art in the file is deleted as a consequence. If a printer chooses to adopt options 3 or 4, these are chargeable options which may harm the integrity of the file supplied to the printer as it has now been edited. My own work recommends the applying Crop Marks and Page information only, having crop offsets of 5mm, and having bleeds of 5mm all around. This is illustrated in the image below.